In a small pan, scald the milk (until you see steam). Remove from the heat and cool to 110-115 degrees. Add 1/4 teaspoon sugar and the yeast and let sit until frothy, about 5 minutes. Whisk together the egg, egg yolk and 6 tablespoons sugar. Pour into the bowl of a large, standing mixer. Add the yeast mixture, flour and salt and mix with a fork to combine until the flour is moistened. Add the butter. Place the bowl on the standing mixer and fit it with the dough hook. On the lowest speed, mix until the mixture comes together forms a ball. If necessary, stop the mixture and scrape the sides and bottom with a rubber spatula. Knead the dough, on Speed 2, until smooth, about 10 minutes. The dough may be slightly sticky at this point, and that’s okay. Butter a large bowl. Remove the dough from the mixer bowl and transfer to this bowl, turning to coat with butter. Cover with plastic wrap and place in a warm place until doubled in size (about 1 – 1 1/2 hours). Combine the 3 tablespoons sugar and cinnamon. Generously butter a loaf pan. Here’s where you have a choice and can make this your way. You can (a) start at short edge or (b) start at the long edge. Either way tightly roll the dough and pinch the seams. If you rolled starting at the short edge, at this point just place the dough in the prepared pan, seam side down. If you started at the long edge, bring the ends together and give the whole thing a twist. Pinch the seams together. Place in the prepared pan. Cover lightly with plastic wrap and place in a warm place. Let rise until double in size (about an hour and half – 2 hours). Place the oven rack in the middle of the oven and preheat to 350 degrees. Bake for about 35 – 40 minutes or until golden brown. Bread is done when it sounds hollow when thumped. 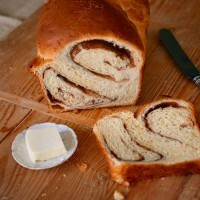 *Note: Total time to make Cinnamon Swirl Bread includes about 3 hours standing time for the dough to rise two times.